There was some left over frosting, and there was a birthday to celebrate. So the plan was to bake a simple cake with a simple decoration. 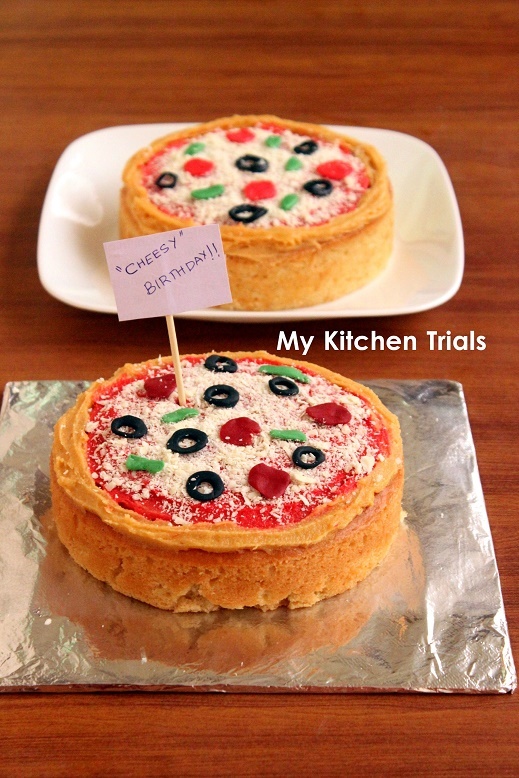 The pizza cake fitted the bill perfectly. And so here it is, decorated with chocolate and delivered with love. Please don’t use a chocolate cake for pizza cakes. The rim and the bottom will be brown in colour. If you are using a chocolate cake, you will have to frost the sides using a ‘sandy’ colour. Preheat the oven to 180C. Grease and line two 9″ pans with butter paper. Mine was two 6″ pans. Whisk the baking powder and flour in a small bowl. If using egg replacer, follow the package instructions and prepare. Beat the eggs/egg replacer and sugar using a hand mixer for a minute or two. Add the oil, vanilla and beat again until its all incorporated. Tip in the dry ingredients into the wet and beat again for a minute. The batter should be smooth and creamy, without any dry lumps. Pour the batter into the prepared tins. Bake for 30-40 minutes or until a skewer comes out free when inserted in the middle. Once its baked, take it off the oven and let it cool in the pan for 5 minutes. Turn it out into a wire rack for cooling further and peel off the butter paper. Once it’s completely cool, decorate it. Add red food colouring to the frosting and apply on top of the cake, leaving 1/2 ” all around for the rim. I used the leftover dulce de leche icing, which is sandy in colour. I used it as a border all around. 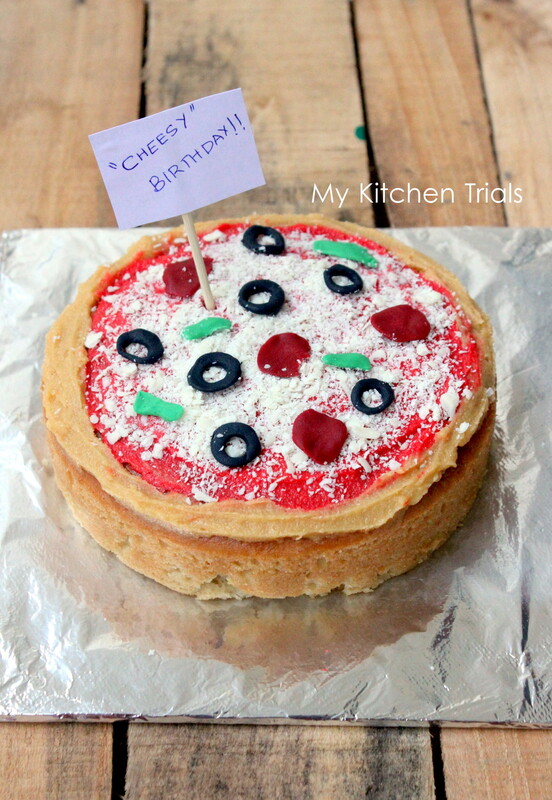 You don’t have to use it, the cake itself can be the ‘pizza rim’. Sprinkle grated white chocolate for cheese. 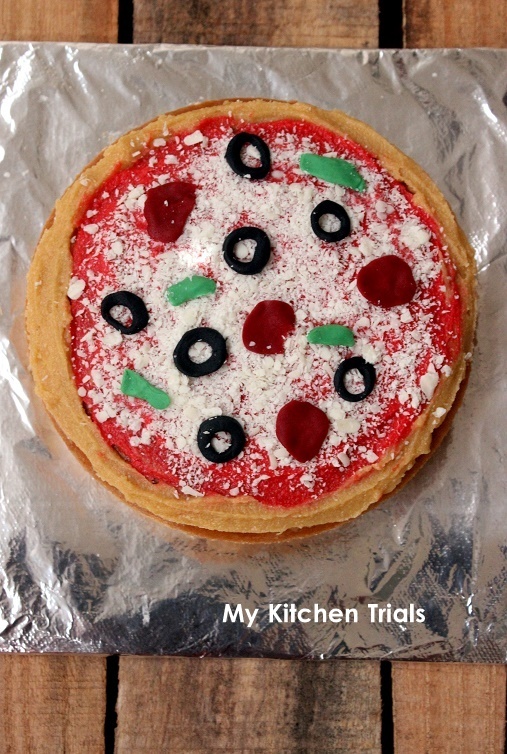 For olives, take a small piece of fondant. Make a ball and flatten it a bit. Using a big piping nozzle cut out a circle. Using a smaller piping nozzle, cut out an inner circle, leaving a ring. Use this as olive. Make more of these and place as you need in the ‘pizza’. For tomatoes, make a ball of a small piece of red fondant. Flatten it and place where you want it. For green peppers/capsicum, take a bit of green fondant and shape into small bits. Now, arrange your olives, tomatoes and green peppers wherever you want them and you are done!! The cake was soft and fluffy on the day I baked, but it was a bit dense the next day. Not sure whether it’s because of the egg replacer or the recipe itself. This is the set up for the above photo. 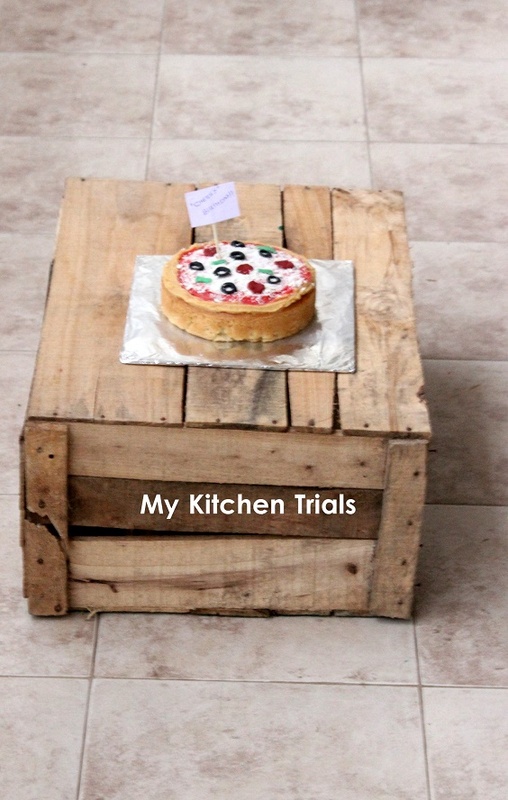 The cake is placed on a wooden box which I got from the supermarket near by. They get vegetables in these kind of boxes. It’s not of high-grade quality, but this will do for taking pictures.